Musings of The Mom Jen: Operation: "Me in a Picture"
Home > Kids, Me, Photo > Operation: "Me in a Picture"
Operation: "Me in a Picture"
Mother's Day, the perfect opportunity. I'd mentioned before that I'm going to start challenging myself to get into some of these photo memories. The scrapbooks are missing me, and it's time for a change. So no better time than Mother's Day. After a long full day at an amusement park, I come home to download all the pictures. I'm in 3 of 70+ pics. That's what happens when you go for the food instead of the rides. By the way, I'd like to commend myself for not making myself sick with "carnie food." But, dang are those Dippin' Dots good!! 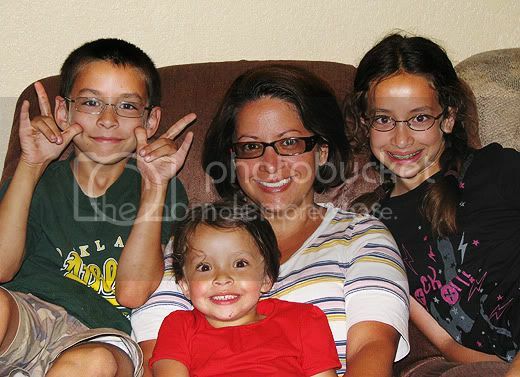 So before bed, sweaty, sunburnt, and exhausted, hubby shot a few pics of me and my sweet kids! That's a double "I love you" sign, not my boy being a punk! So there, it's my pic of the week. It might be pushing it, but maybe I can get one in once a week. Now that I have my new Incredibles Super Hero Mask glasses, I feel goofy confident that I can have a good picture taken of me. How about you, are you constantly behind the camera and never in the family memories?! I'm in very few pictures with my children because I am taking the pictures. Great shots and I hope you had a great day! Great pictures! I love your new glasses! Very trendy! Good challenge! I'm NEVER in ANY pics. I may have to set up the tripod w/timer. The pics should be interesting with two 13month olds!!! Those are GREAT pictures! I, too, am often NOT in the pictures. When I do give the camera to my husband it comes with the warning, "Make sure you don't cut my head off!" Sounds like a wonderful Mother's Day! Wishing you the best! This picture is adorable with you and your kids!!! Hope you had a good mother's day! Great pics!!! I have the same problem....always behind the camera but I also made the effort yesterday. The amusement park sounds fun!!! I keep trying to get my wife in front of the camera, but she's just having none of it. great pic of you and the kiddies. Gorgeous, gorgeous family! Happy Mother's Day! Always behind the camera...and when I try to get a picture, the kids don't cooperate! awww love those shots! The double I love you.. melt my heart! I like the new glasses! That is too funny. I was uploading pics to a card for my Grandma's new digital frame and I had to go back to my wedding to get pictures of me. I am either holding the camera or deleting the ones of me before saving. But, for the record, I love the glasses. LOL...you know what, most of the time you won't see me in pictures either...because i'm always behind the camera. Your kids are sooooo cute!! the expressions on their face. But I did notice how you striked out some words and replaced them with a different word(s) instead of backing the words out and re-writing it. "masks" at times or all the time. Its a cover up of our true selves or our true feelings that we are afraid to express to the real world. I think I need to do the same. DH is in way more pictures than I am... good idea! I am in very few pictures too...sigh. While I am absolutely skinny/gorgeous/beautiful/fantastic and always camera ready - it seems that EXACT replica's of me on film (or whatever's inside digital cams) looks larger/appalling/scary and cannot possibly be an accurate portrayal. I am taking that challange right now with Carin over at forever in bluejeans. We join in every thursday to post a picture of us from that week with our kids. It is very fun! 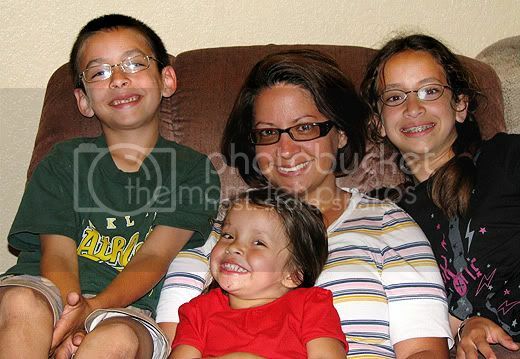 Great pictures and wow your kids look alot like you! So cute, your whole family. I am usually ALWAYS the one taking the picture too. Love your glasses. I have been hunting around for a new pair for myself. I really can't stand getting my photo taken. I think the last time I sat for a family portrait my daughter was about 18mons. She turns 20 in two months. I think I'm overdue for a new picture. You all are so adorable. These photos are wonderful. I realized I was never in pictures when I joined Facebook and couldn't find a profile pic. I'd say you're 3 out of 70 is pretty good -- I'm lucky to be in 3 out of 170! It's funny, I also recently resolved to hand off the camera more often. I'm just sorry I didn't take any pics with the kids yesterday. We had a great mother's day but I never thought to have someone take our picture. I do try to pose with one or the other when the opp presents itself! The hubs loves, loves, loves dippin dots! Very cute pics. I know I said it before but man I really need to do this! The pictures are so cute, and I LOVE your glasses, I must have them! And yes, if anyone broke into my house and stole all my pictures, they would SURELY think my husband was a single dad. NO SHOTS OF ME EXSIST! Of course those are "I love you" signs. I can tell your son doesn't have a "punk" bone in his body. I'm loving the new glasses! And this picture really shows how much your kids favor you! I am in most of the pictures since hubby takes the photos! The shots of you and the kiddos are great! Happy Mother's Day, Jen! ps. Carnie food TOTALLY rocks. I am definitely in a small percentage of the pictures, but I do try to hand the camera over to someone else every once in a while. :) You are super cute! Hubby was just whining about that the other day. Apparently all I'm sending him are pics of the kids. Of course, to get pics of me, I need to figure out how to use the self timer...either that or trust a kid with my camera! I have the same issue. Right now we just need a new camera and also losing a few lbs might help LOL. I do try now though, it is sad to look through the memories and not be there, what if I die my daughter is only 1 1/2 year. Love the peepers! So chic! And I, too, am rarely in front of the lens...too many hours of photoshop needed before I would allow the images to be "scrapbooked". I know my kids will be sad some day when they have few photos of their mom, so I will accept your challenge...or maybe just paste my head on some magazine photos of Scarlett Johanssen! BTW...hope you had a Happy Mother's Day! You all look so happy and beautiful! Good for you, my friend! I am only in about 4 pictures in the 15 years I've been taking them. ps- you have gorgeous pearly white!! The photos are beautiful! I am ALWAYS behind the camera. I have said I need to have a few pics of Tara and I!